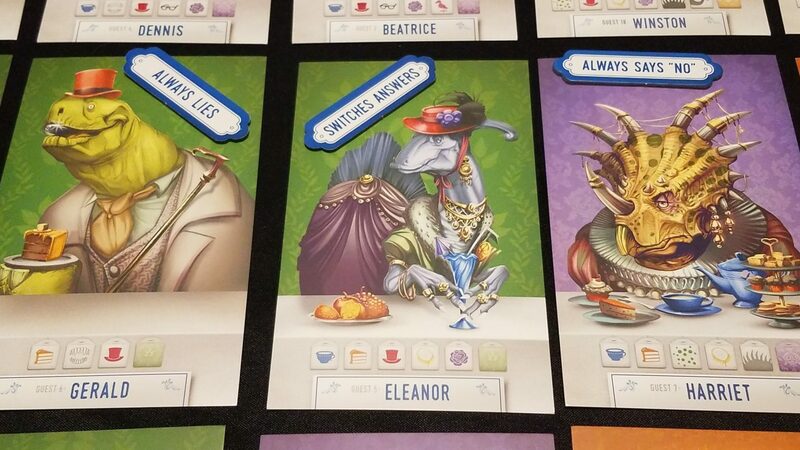 In Dinosaur Tea Party, you'll try to deduce the identities of the various party-goers. Though some might find it to be a little too simplistic, for the right crowd, Dinosaur Tea Party is a light, accessible filler that's no more filling than a cucumber sandwich! 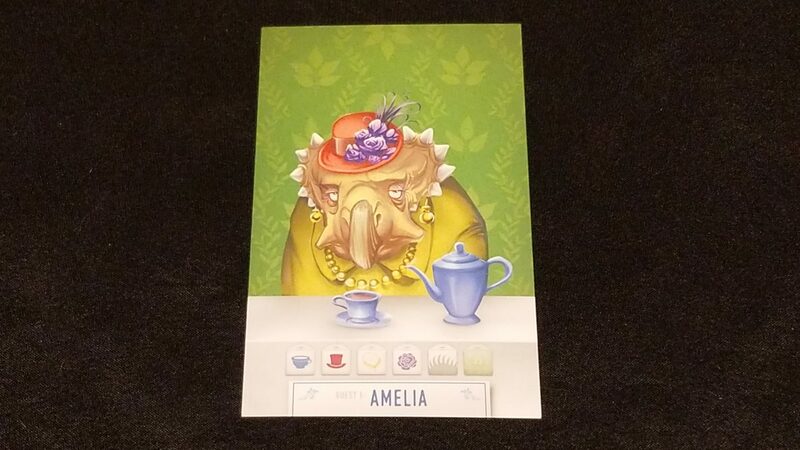 The conceit of Dinosaur Tea Party is perfect in its absurdity: you have finally received an invitation to high tea at the ludicrously exclusive Dinoton Abbey. Dressing in your finest, you make your way to that most prestigious venue, only to discover, to your considerable horror, that you have completely forgotten everyone’s names. Amidst the crowd of Kenneths and Tabithas and Quintons, you find yourself face to face with the social faux pas of the year, should you not manage to small-talk your way gracefully past this egregious lapse in memory. Jess: Also, you’re all dinosaur. Andrew: Did I not mention that? Oh yes, that’s important. There are games that are fun because of their structure – the fun to be had by engaging a game’s rules and mechanisms. Then there are games that act as vehicles for fun – creating spaces and situations that evoke laughter and enjoyment. Dinosaur Tea Party is decidedly the latter of these two. What we have here is not a game burdened with even the barest hint of mechanical complexity, and even that is a bit of an overstatement. Instead, Dinosaur Tea Party concerns itself with being accessible, light, and evocative of lots of laughter. Doing what they do best, Restoration Games (Downforce, Indulgence, Stop Thief) has once more plumbed the depths of board game history to extract the skeleton of a game (“Whosit”, originally published in 1976), reworked its concept, polished its rules, and delivered it with their trademark excellent presentation. 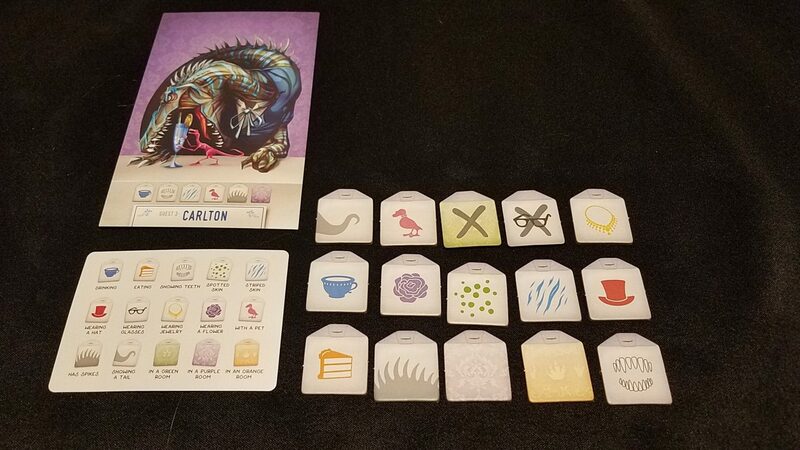 Updated both in its mechanics (however few they may be) and its theme (eliminating some unfortunate stereotypes which plagued the original), Dinosaur Tea Party is a quick, light game for the modern table. Jess: I mean, really, is there anything more modern than dinosaurs? The game is simplicity itself – be the first to deduce the identity of 3 other party guests. 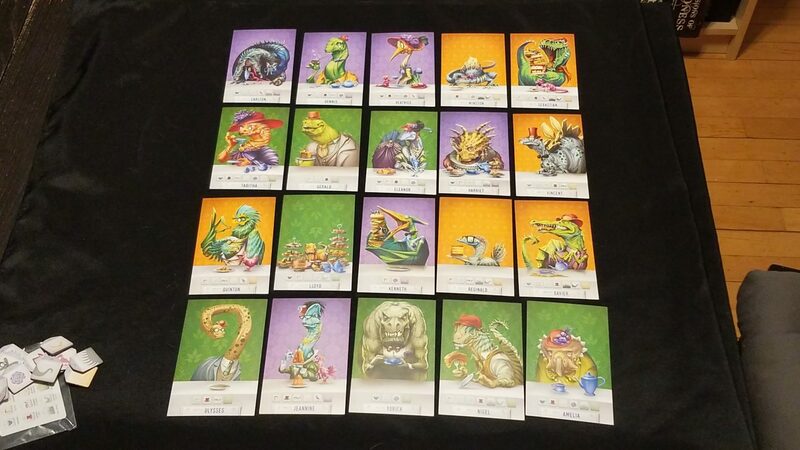 Each player has an identity card, which tells them which dinosaur they are currently playing, and what traits that guest possesses. Each turn, players will have the opportunity to ask them a question about one of their traits (are you wearing a hat? Glasses? Are you striped? You know, small talk). The player asked must answer truthfully yes or no (with some minor exceptions, which we’ll get to). Jess: But don’t just ask ‘Are you wearing glasses?’! 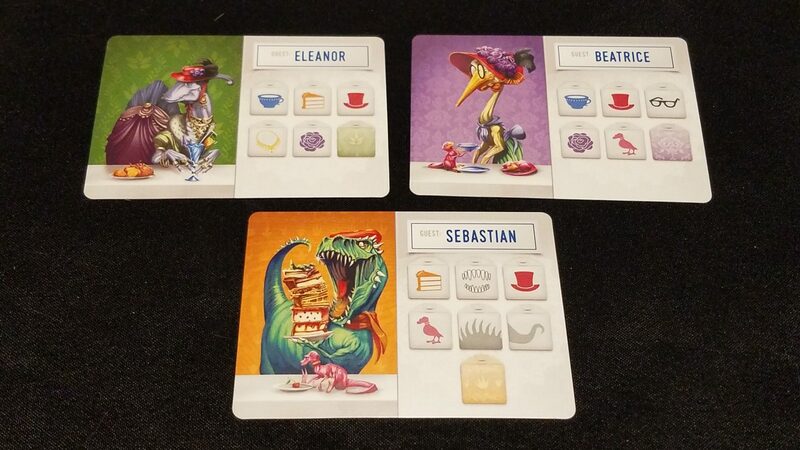 This is where a lot of the fun of Dinosaur Tea Party will surface, as players have a chance to be goofily in-character as they all put on their most posh accents and try not to bake a fool of themselves while they make total fools of themselves! Andrew: Absolutely. 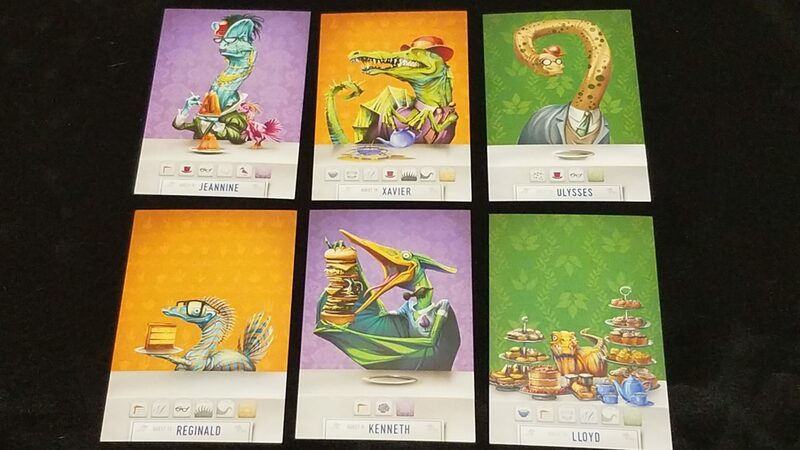 Dinosaur Tea Party works so much better if you let yourself really get into it. Mention Paul Hollywood! Describe the biscuits as ‘scrummy’! Wonder aloud whether you’ll make it home in time for 8 out of 10 Cats Does Countdown! As everyone at the table answers questions, you’ll probably begin to figure out which party-goers you’re hanging out with. Instead of asking a question, you can guess another player’s identity. If incorrect, your punishment is the awkwardness of the other guests’ judgment. 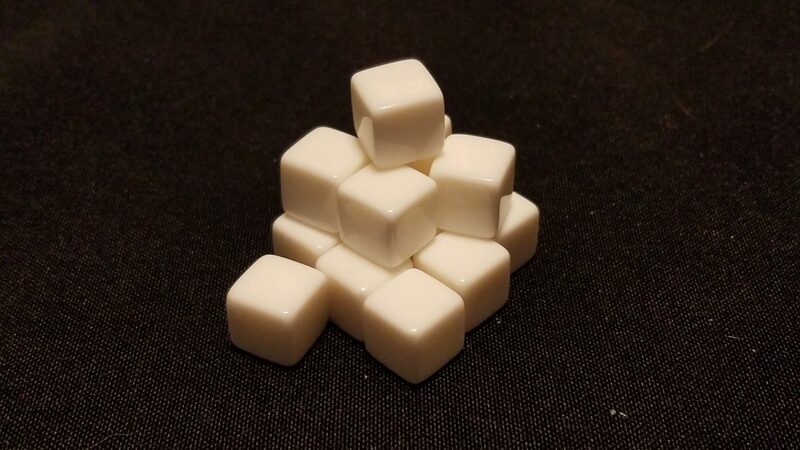 If you are right, you will collect one of the three sugar cubes needed to win! And that’s it. The player you guessed correctly will get a new identity, and the game will go on until someone gets that third cube. The only wrinkle in this otherwise dead-simple gameplay are the ‘quirk’ characters, who are randomly assigned to either always say ‘No’ regardless of the question, alternate their answers between ‘Yes’ and ‘No’, or always lie. These quirks throw in a neat bit of variance to the otherwise very clean-cut nature of the mechanics. Andrew: So, let’s be clear – Dinosaur Tea Party is dead simple. And I know that for many, it will be too simple. The fun of the game is in the silly interactions you can choose to have, and in the straightforward deduction puzzle of figuring out who your fellow party goers are before they can do the same. But honestly, that’s just fine by me. Jess: Me too – this is a game that anyone can play, and even though I don’t know if everyone will enjoy it, I don’t know that it needed to be anything other than what it is. Strategic? Nope. Tactical? Kinda. Fun? As fun as you make it. 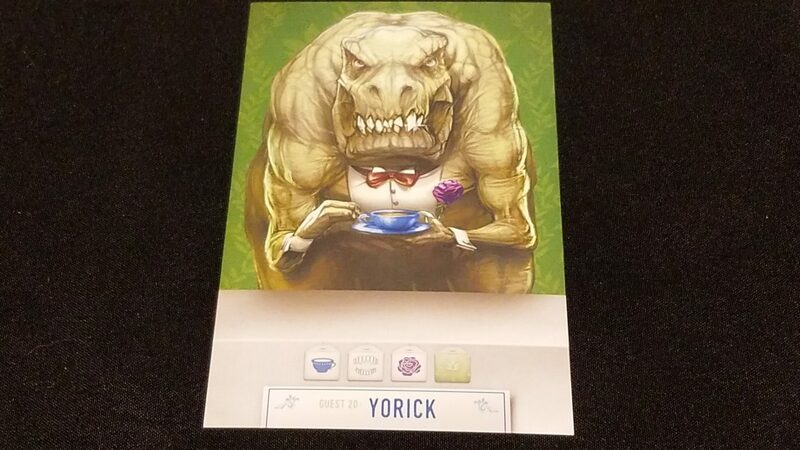 While Dinosaur Tea Party could cause some folks to turn their noses up at it because of the simplicity of its mechanics, we say just don’t invite those people to your next Dinosaur Tea Party. They sound like real Amelias anyway. For more fun with Dinos: Dinosaur Island – This massive worker placement game has players running a dinosaur theme park, featuring the actual dinos they will be genetically engineering during the game! 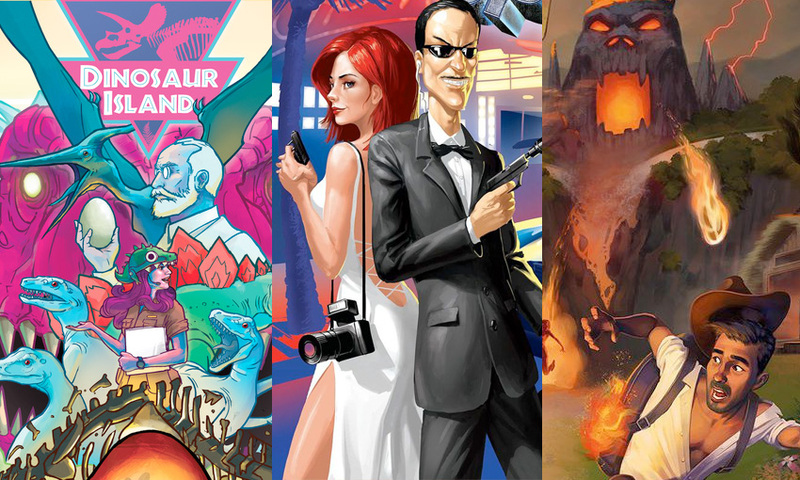 For even more fast-talking deduction: Spyfall & Spyfall 2 – Bluff your way into fooling the table! The players in Spyfall have all gathered in a secret location for a clandestine meeting, but one among you is a spy…and has *no idea* where the meeting is supposed to be taking place. Ask questions, trick each other into revealing your ignorance, and accuse that spy for the win! For another blast from the past: Fireball Island – This one may be cheating a bit (it’s another Restoration Games title), but Fireball Island is a truly fun reimplementation of the classic of the same name. With a massive board, lots of goofy take-that moments, and the potential to add expansions with bees, snakes, and a pretty derpy tiger, this one’s been a hit every time it’s come to our table.